This precious image of a babys feet sticking out from under the covers will make the perfect baby gift. 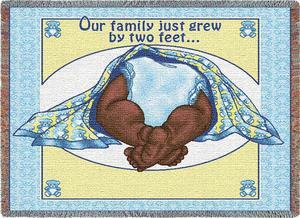 "Our family just grew by two feet" are the words that are woven into this throw. Plenty of room is left for embroiders to stitch in the baby's name.